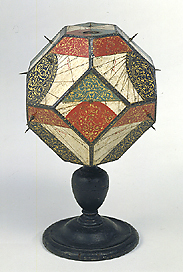 This table sundial, which is of polyhedral form, has eighteen decorated and painted faces. The hour lines are inscribed on every face in a different manner, corresponding to a different type of dial: horizontal, vertical, declining, etc. In use the instrument was oriented with the help of the compass. The instrument is signed 'DSF', and the style in which it is made is typical of Stefano Buonsignori, Olivetan Friar and cosmographer at the court of Francesco I de' Medici.